The Skully AR-1, a high-tech helmet aimed at making motorcycle riding safer by letting riders see what’s behind them, is now available for preorder. The helmet is being sold exclusively on Indiegogo for $1399 and is expected to ship in May 2015. The price of the helmet will go up to $1499 after a 30-day campaign. The Skully AR-1 helmet features a heads-up display that give riders a live feed from a rearview camera. The helmet features a heads-up display that shows a live feed from a nearly 180-degree rearview camera. The view of the back of the road is displayed outside of the rider’s primary field of view and appears about 10 feet away. The AR-1 is designed to make motorcycle riding safer by allowing riders to constantly see what’s behind them and in their blind spots without having to turn their head, according to Skully. “The AR-1 will introduce a new era in intelligent transportation by combining optics, intelligent vehicle systems and connectivity to deliver unprecedented levels of safety,” Skully founder and CEO Marcus Weller said in a press release. The helmet connects to both iPhone and Android devices via Bluetooth. Other features include GPS navigation, speakers, a microphone and voice control. The built-in battery that powers the display and electronics lasts for about nine hours, according to the company. 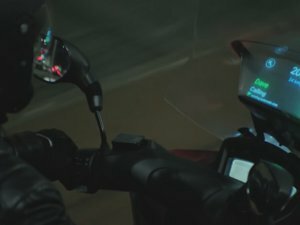 The AR-1 was introduced last October at DEMO, and Skully said more than 100,000 motorcycle riders have signed up to be beta testers since then. Weller came up with the idea for the helmet following a motorcycle accident in 2011. Melissa Aparicio is multimedia correspondent for the IDG News Service.